Tools to Steal, when the Relic with the Capture flag checked. EDIT: about the Umaro patch, you applied it with a header on your ROM you sure? Okay, so why isn't Locke's command changing at all, then? Up a plus side, the Dance patch and Rage hexing worked fine, game runs fine and Dance and Rage only last one turn. Progress at last. I'd have to say because you're not doing it right. Other than that I'm not sure, it's not character specific or anything, if the character has the command Tools on them and you did the edit exactly right and enabled the Control flag for the Relic, and have that Relic equipped, it will change Tools to Steal. I can check out your ROM if you'd like to see why it's not working there for you. The Functional Umaro patch is not glitching/freezing in battle for me, applied it to this clean headered ROM here I did the Tools to steal edit with. I made the patch and am using it in my own hack, so I know it works, but I had to test anyway. I'm really not sure what all you got going on there to have it freeze in battle, except your ROM is not headered when you applied it. That's all it could be. It's nothing I've done with Hex. 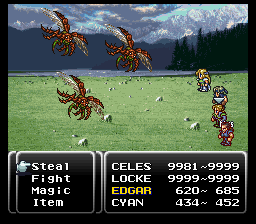 I took an unedited rom, changed Locke's Steal to Tools, saved it, and it still shows up in-game as Steal. I did the hexes and it works fine for Edgar's Tools, great. Where's Locke's Tools? As for the Umaro patch, at this, really don't care. If it's something that can easily be changed in the Hex to make him controllable and equippable, I'll try it, but with how much stress all this madness has bean, Umaro being fully function is honestly not that important. It's just something I'd prefer. Ohhh, well that's because you already recruited Locke, right? It's like the character palettes, those are his properties and have already been loaded. You need to play before you get Locke, and then he will have Tools instead. (01-23-2016, 09:25 PM)DrakeyC Wrote: Added Rippler, ZSNES says Bad Rom. Went back to Evade-only version and added Umaro, [...] And I don't care if ZSNES says Bad Rom or not - if it can run fine and up to the first fight, I'm calling it good. I'm about ready to collapse from this nightmare. This is because when you cange bytes in the ROM the expected checksum does not match the one calculated. It has no effect on the gameplay, but in you final release you could use a tool such as this one to recalculate it. Okay then, thank you for letting me know. Given that it works for Edgar, I see no reason it won't work for Locke, so okay. ^^ I have no clue what you just said, but thank you anyway, it runs okay now. The Umaro patch, for whatever reason, was the problem. So, with the Thief Glove changed, I'll move around the physical location of the item myself. I'll look into the Duncan's wife stuff later, I am mentally exhausted from all of this today. I'm going to move forward with the (considerably simpler) item editing, and will post if I need further help. Overall - THANK YOU SO VERY, VERY MUCH everyone. I'd say I couldn't have done all this without you, but I think the last four pages are proof enough of that. No problem man, glad to be of service. It's always nice at the end of the day to have made progress, good job. Well, on the Umaro front. The good news is that with a header added, the patch applies fine. The bad news is that it doesn't work, he's still a berserker. What about the "Equippable Umaro" patch? Try that instead, maybe? Nah Equippable Umaro is just for, as you may of guessed, having him be equippable. I thought Functional Umaro would knock of the beserk, as well as allowing him to equip skills, but maybe the berserk thing is taken care of elsewhere. It's been so long I can't remember off hand, but I'll look into that here.